Large Cats seen by locals for a number of years. 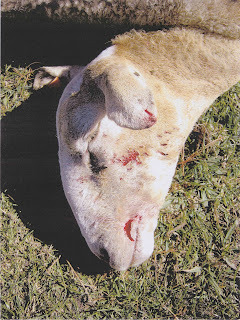 Farmer X kindly sent me some killed livestock photos. 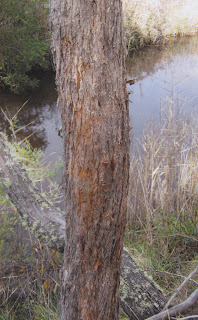 Tree marked by claws..same type of images we used to see in Grosevale. About 8 years ago we showed the tree damage to herpetologists and asked them if it was due to lace Monitors or koalas..all said "no". National Parks and DPI staff came on site.. They did not know which species of animal had caused the tree damage. DPI said it was an animal from the National Park, not their problem..
National Park said it was damage done on private property therefore out of their mandate. DPI said "this does not prove its a panther". Of course it flipping doesn`t..we never said it did. Regarding the dead sheep..the marks on the face..are indicative of claws not a canid type "bite". So, into the bin goes "it was wild dogs"..